The first specific recommendations for Croatia since the country's accession to the EU almost a year ago, provide a relentless analysis of the economic situation in the youngest member and are much more specific than for the others. The recommendations are eight and are accompanied by deadlines for implementation. The Commission's analysis as well as the recently completed IMF mission in Zagreb show that the time for dragging feet is over and from now on any political bickering and blame game will only deteriorate the country's perspective to exit the crisis. In the IMF's assessment it it said that "Croatia remains stuck in an unusually drawn out recession". The key here is in the word "unusually". What the government needs to do is to develop a comprehensive strategy for fiscal adjustment in the mid-term in order to reduce uncertainty, the IMF believes. The European Commission is much sharper and specific in its analysis. According to Brussels, the Croatian government's national reforms programme is using a different methodology for accounting than the standards of the European System for National and Regional Accounts (ESA), thus creating a confusion and making comparisons difficult between the cabinet's forecasts and the European Commission's spring forecast for 2014. Besides, in the programme there are not enough details about the government's measures for consolidation in 2015 and 2016 and, more specifically, with regard to the spending side. Among the criticisms are also the recently amended fiscal rules which the Commission expects to be improved especially with regard to the efficiency of the fiscal framework because in it there are no prevention mechanisms and, generally, there is weak compliance with the public debt rule. The creation of a commission for fiscal policy is welcomed, but it has to be strengthened in terms of budget planning and monitoring as well as to ensure its independence from all budget authorities. The Commission's overall assessment is that Croatia is conducting structural reforms but they are more timid than what is needed to exit the recession and to reduce the rapidly growing unemployment. And while the Commission recognises that there are objective factors for this, the analysis suggests that the blame for the continuity of the crisis lies with governance and culture. The Commission is attempting a really in-depth analysis by pointing out as serious problems the lack of transparency in governance and the bad business environment. The current regulatory framework for doing business in Croatia imposes high burden on business in addition to the lack of legal certainty, non-transparent decision-making, especially at local level, and the numerous para fiscal charges. The responsibilities of the public administration are strongly fragmented at regional and local level and there is a complex system for competences sharing between ministers and agencies at central level, which complicates business decision-making and prolongs the administrative procedures. There is no sufficient control on public subsidies and guarantees. State-owned or state-controlled enterprises demonstrate weak governance and the application of the new strategy for management of public assets and enterprises faces delays. Currently, there is no procedure for a competitive selection of members of supervisory boards of enterprises and their management. Appointments are not being published. It is reported that measures have been undertaken to improve the anti-corruption framework, but is noted that more efforts are needed to prevent corruption at all levels of government. The Commission has obviously drawn many lessons from monitoring Bulgaria and Romania precisely in this area under the Cooperation and Verification Mechanism and also from monitoring the EU's economies in the framework of the European semester, because it says directly what is missing and what needs to be done. What misses also in Croatian efforts to fight corruption is efficient mechanisms to verify conflict of interest and reveal assets owned by public servants, as well as specific safeguard mechanisms for the state-owned enterprises. The anti-conflict of interest commission relies mainly on the competence and pro-activity of other authorities. Progress is reported in ensuring transparency in the public procurement procedure, but not always the tools for risk assessment are used. These problems are reviewed in much more detail in the first of its kind European Commission report on corruption in the member sates, which euinside wrote of. The Commission also believes that in spite of the numerous reforms aimed at improving the efficiency of the judiciary, court procedures for civil, commercial and administrative cases continue to be unjustifiably long, especially in first instance. The backlog cases have increased in 2013 and their number is very high, especially in terms of the civil and commercial procedures. Strong impression in the Commission's analysis makes the part about the country's banking sector. In this section the assessment diverges from the IMF's views. The Fund generally welcomes the conservative policy of the Croatian National Bank (HNB), but recommends the bank to continue to pile foreign exchange reserves. The Commission believes, however, that this conservatism contributed for some sustainability of the banks, but the economy is entering a sixth consecutive year of recession and there is a growing number of non-performing loans, which creates a risk for the quality of bank assets. The Commission pays attention to the fact that four of Croatia's biggest banks will be subjected to stress tests and asset quality reviews by the ECB this year because they are foreign. This is precisely why the Croatian authorities are recommended to perform a similar procedure for the rest of the banks, especially the medium and smaller ones which are possible to have lower quality assets. High quality assets is a major condition for financial stability. Against the backdrop of this analysis, the Commission sends eight very specific recommendations. The first is to align the reforms programme with the ESA standards and the Stability and Growth Pact. By March next year a very thorough review of spending has to be done. By October this year the independence of the fiscal policy commission has to be enhanced. Also by the end of the year, the Croatian authorities are expected to present an action plan for improvement of tax compliance. The second recommendation is by March 2015 to be adopted legislation to accelerate the planned equalisation of the retirement age between men and women, to reduce early retirement and to increase the efficiency of the health care sector. As a matter of fact, the health care reform, which is heavily criticised in Croatia, has received the best evaluation by Brussels and there are no criticisms against it, except the expectation to be implemented in practise. Recommendation number three is continuation of the labour market reform as here, too, a specific deadline is set. By March 2015, the second phase of the labour act must be complete and by the end of this year plans have to be drawn to reduce undeclared work. Also by the end of 2014 Zagreb is expected to review all the systems for tax relieves and to present an action plan to improve the reactivation of inactive and unemployed people. Again by March next year, measures have to be undertaken to improve the business environment and especially to significantly reduce administrative requirements and para fiscal charges. By October this year, a detailed plan has to be prepared for management of publicly owned assets that should ensure that state-owned enterprises are managed in a transparent and accountable way. Special focus in this plan has to be paid on enhancing the requirements for competence of the members of management and supervisory boards of companies and all appointments to be made public. Although Brussels is very specific in its recommendations, it does not say directly that this practically means that an end should be put on political appointments in state-owned or state-controlled enterprises. The seventh recommendation is by the end of the year the role of commercial courts to be strengthened to enhance their monitoring over the transparency and legality of the application of the pre-bankruptcy settlements procedure and the eighth one recommends Croatia to join the asset quality review of the ECB this year by thoroughly reviewing the banks that are outside the Single Supervisory Mechanism with a focus on medium and smaller banks. The first country specific recommendations for Croatia show more than clearly that the new EU member has serious problems. They can be partially explained with the country's transition from centrally planned economy and post-war recovery to democracy and market economy. It will be very important how will the country's political elite read this analysis. The first symptoms are not goot. 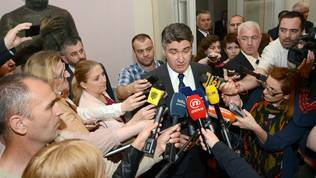 Prime Minister Milanovic's first reaction was that the assessment of Brussels is very good. Currently, the society is entirely preoccupied with the scandal between Milanovic and his former finance minister Slavko Linic. It is indisputably important to clear all doubts in the integrity and good functioning of the government, but equally important is to begin real and open debate about the situation of the Croatian economy and to draw the way forward. A path which requires a really national consensus as there are many calls for it. Let us hope Croatia will show maturity and will succed to handle Brussels's assessment soberly. If it enters a battle with the Commission on how much it is interfering with the domestic affairs of a sovereign country, this will mean to lose the battle to exit the crisis.